I met Chris at Salcott, and left one car there, driving back to Maldon to have another vast bacon bap on the barge before setting out. 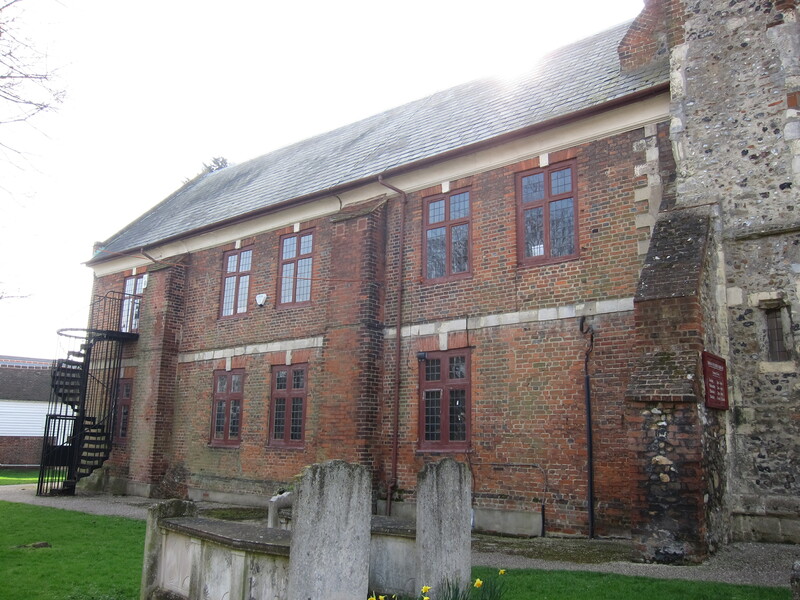 Maldon is a really interesting town being one of the oldest recorded settlements in East Anglia. It was the site, in AD 991, of the Battle of Maldon where Aethelraed the Unready, King of England, was defeated by a vast Viking army, despite the valour of Byrhtnoth, earldoman of Essex. Following the defeat, Aethelraed began the practice of paying “Danegeld”- effectively protection money – the first payment being of 10,000 pounds of silver. Leaving the town, we passed a fair number of Victorian mills and workshops, then turned to walk down by the side of the canal to the waterfront. 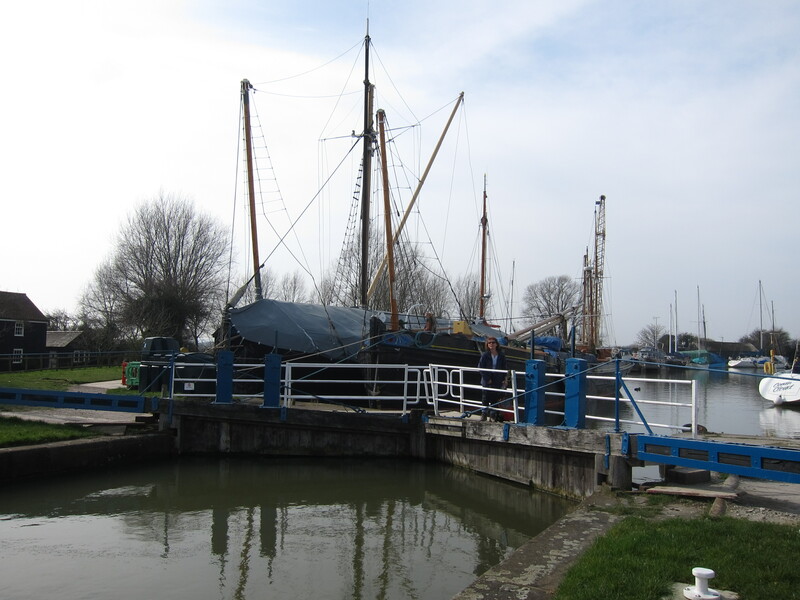 Maldon has been a centre for working boats for centuries, and, although there were a few pleasure craft around, it was most interesting to see the old barges, many now restored. Leaving the town, the walk continues along the sea-wall – not varying greatly from previous stretches, but delightfully warm, with none of the howling gale we encountered last time. 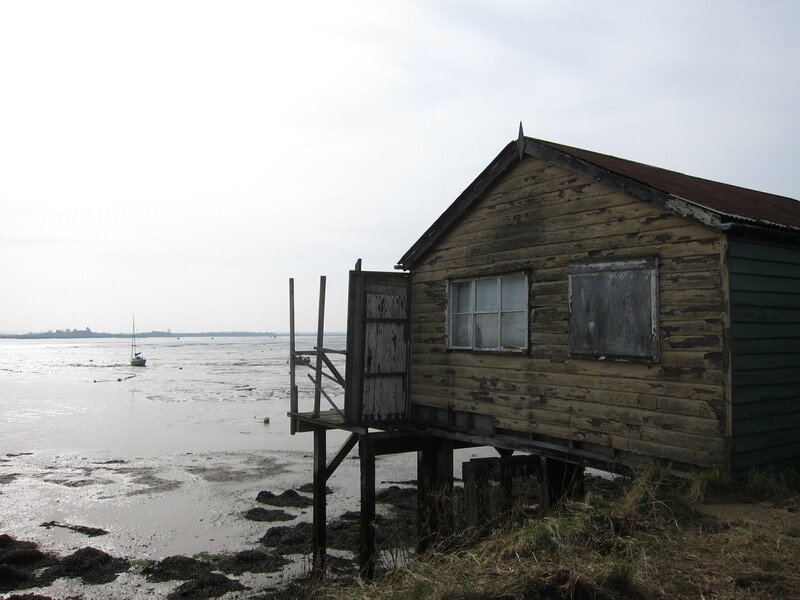 A collection of almost derelict summer houses on stilts overlooking the mudflats caught our eye – Chris was ready to start renovating there and then. As we walked out of the estuary, back towards the coast, I could see Bradwell Power station, which I passed back in December – I am not feeling as though much progress has been made so far this year! We promised ourselves tea and cake in Tollesbury, but, unfortunately, all of the cafes had closed by the time we arrived. 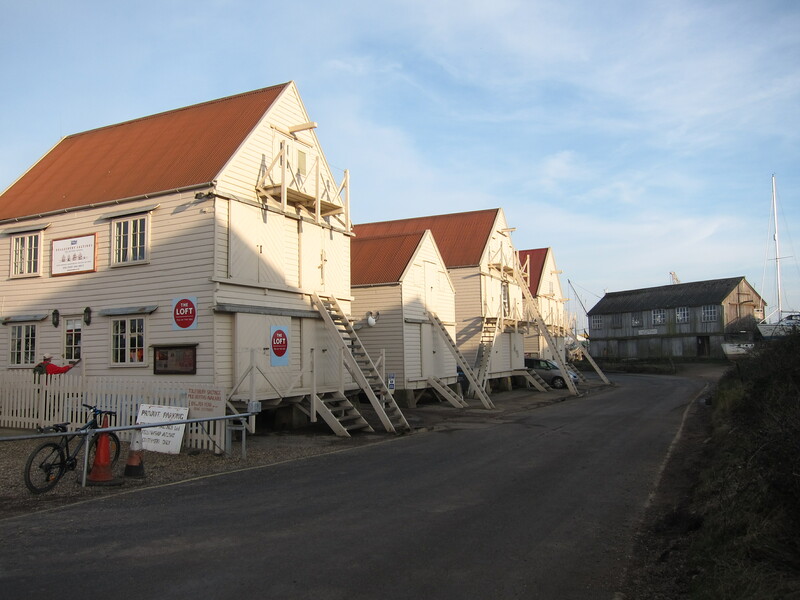 The boat sheds were attractive, though. 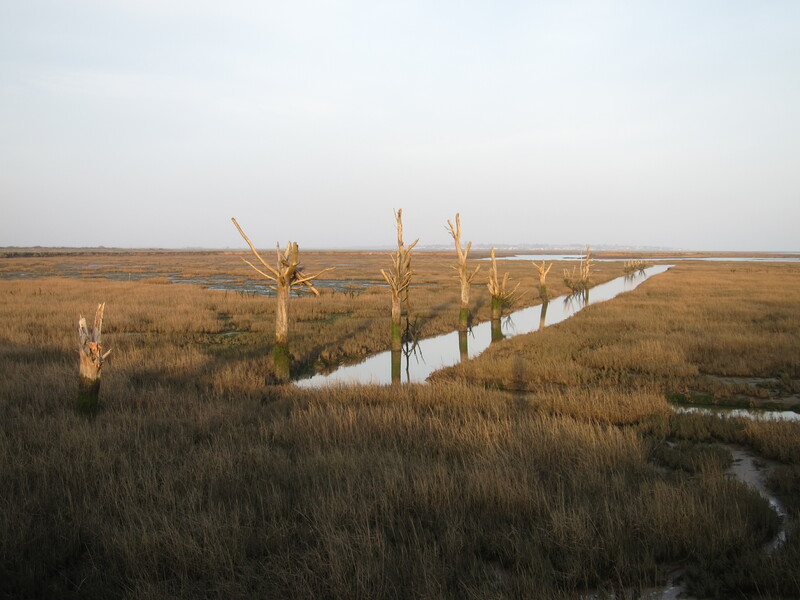 Finally, as the shadows were growing longer, we passed an area that had originally been salt marsh, and then was drained about a hundred years ago, but over the last 15 years has been allowed to return to salt marsh by the deliberate breaching of the sea wall. We met a very chatty lady and her labradoodle who told us all about it, and that the local landscape was used for the filming of Great Expectations. The drowned trees have a very eerie appearance. We covered just over 19 miles to make a total of 666.2 (I include the 0.2 to avoid the whole number! ), and I am delighted to say that I have now passed the 10% mark! I am thrilled with this milestone. How come I have now settled on 6,500-6,600 miles after not being sure before? Well, my kind friend Graham found and gave me a copy of a rare book called “Turn Right at Land’s End” – written in the late 1970s by John… who was the first person to walk around the whole coast. He completed 6,824 miles in total, and since his rules did not permit the taking of ferries, but insisted on walking up the estuary, I conclude that my total will be a bit lower. My plan was previously to go back down to Plymouth for two weeks over Easter, but this is not going to be possible, for a variety of reasons, so for the time being I shall continue to chip away at East Anglia.